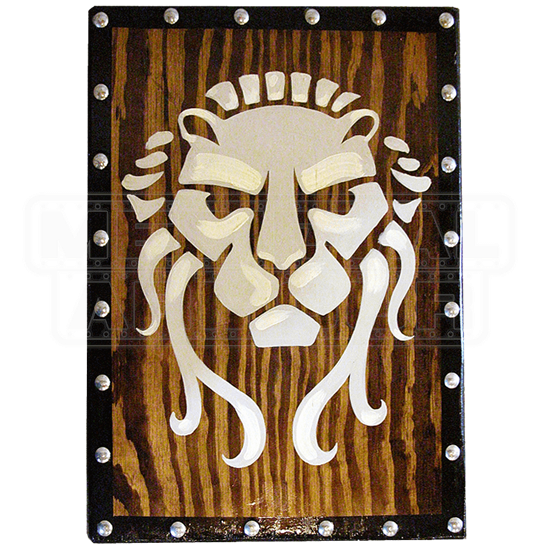 The Early Wooden Roman Lion Face Shield takes the shape of a traditional roman shield, or scutum. This shield was designed with use and decoration in mind. Thus, the shield is not only attractive but also rugged and functional. 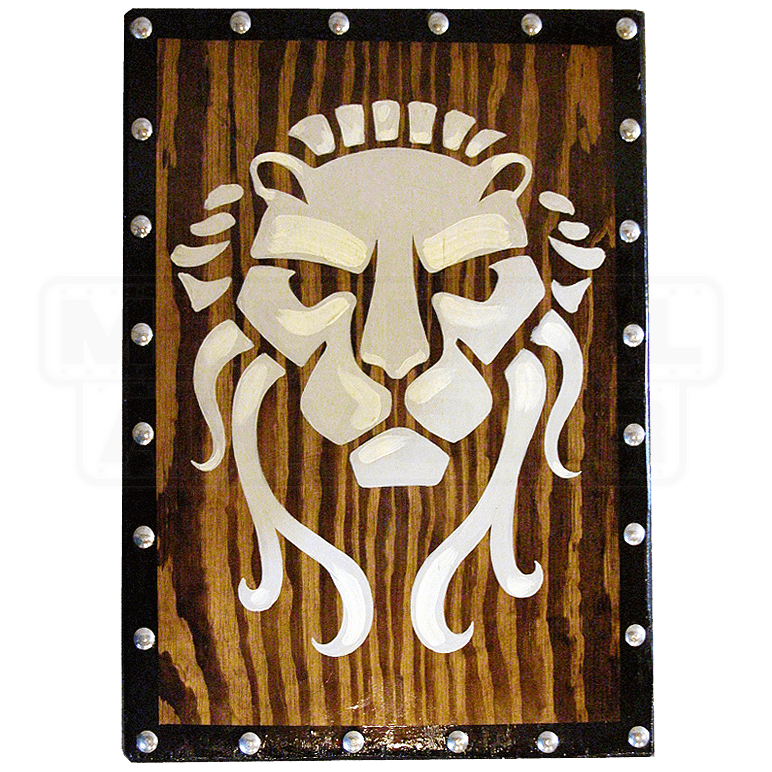 This hand-made, hand-painted shield features the simple yet attractive design of a stylized white lions face painted onto a wood-grain background. The effect creates a shield that looks Roman in nature but appears to pre-date formal Roman military. Round stainless steel studs line the black border of the shield. The shield is made from 0.5 inch thick plywood, which helps to ensure the shields lightness. It can reliably be moved without trouble or difficulty when used. It stands approximately 33 inches tall and measures 22 inches wide. Dual leather straps are attached to the back of the shield to allow for easy wearing. One strap wraps around the arm while the other is meant to be held by the hand, ensuring a reliable, yet easy grip. Several coats of topcoat varnish have also been applied to the front of the shield, to help protect and preserve the shield from whatever wear and tear it might experience over the years. The Early Wooden Roman Lion Face Shield is well-balanced. It performs well when used under the stresses of sparring and battle. It is also a beautiful item that is perfectly suited for use as decoration. Please note, however, that because the design is painted onto a wood-grain background, the each Early Wooden Roman Lion Face Shield will differ slightly in appearance. Just as no two wood-grain patterns are exactly alike, no two Early Wooden Roman Lion Face Shields will be exactly alike either.